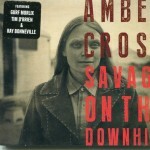 With sparing instrumental backup from a crew including Ray Bonneville, Tim O’Brien and Gurf Morlix, Californian vocalist/guitarist Amber Cross conveys her plainspoken lyrics with vocals just as unembellished and to the point. The end results are consistently “grow-on-you” fare and in the case of the compelling title track, lyrically haunting. The waltz-tempoed ballads “Eagle & Blue” and “Storms of Scarcity” also stand out as do the leadoff track, “Pack Of Lies”, and “Tracey Joe”.